This article is about the city. For the canton of which it is the capital, see Kobanî Canton. Kobanî (pronounced [koˈbaːniː], also rendered Kobanê [koˈbaːne], Arabic: كوباني‎, Classical Syriac: ܟܘܒܐܢܝ‎), officially Ayn al-Arab (Arabic: عين العرب‎ North Levantine pronunciation: [ʕeːn elˈʕɑrɑb]), is a city in the Aleppo Governorate in northern Syria, lying immediately south of the border with Turkey. As a consequence of the Syrian Civil War, the city has been under control of the Kurdish People's Protection Units (YPG) militia since 2012. In 2014, it was declared to be the administrative center of the Kobanî Canton of the de facto autonomous Rojava, which later became the Democratic Federation of Northern Syria. From September 2014 to January 2015, the city was under siege by Islamic State of Iraq and the Levant. Most of the city was destroyed and most of the population fled to Turkey. In 2015, many returned and reconstruction began. Prior to the Syrian Civil War, Kobanî was recorded as having a population of close to 45,000. The majority of inhabitants were Kurds, with Arab, Turkmen, and Armenian minorities. The origin of the name Kobanî (كوباني‎) is the word company, referring to the German railway company who built that section of the Konya-Baghdad Railway from 1911. Kobanî was built between the village of Arap Pinar (Kaniya Ereban) in the east and the village of Mürşitpinar (Kurdish: Kaniya Murshid) in the west. The Ottoman name of the eastern village was Arab Pinar (Turkish: Arap Pınar, lit. 'Spring of the Arabs'), and Kobanî's Arabic name, ʿAyn al-ʿArab (عين العرب), is a translation of this. The word "spring" refers to the creek that used to flow east of the village, and during the summer Arab nomads would bring their herds to the location. This village was located south of a small lake that dried up in the 1960s. The name Mürşitpinar is still used as the name for the western village and the railway station in the Turkish side. Both of the above-mentioned villages are parts of today's Kobanî. The name ʿAyn al-ʿArab was introduced officially by the Syrian government as part of a broader Arabization effort in the 1980s. Kobanî has a hot-summer Mediterranean climate (Köppen climate classification Csa). Prior to World War I, the area was mainly populated by semi-nomadic Kurdish tribes, many but not all of which were part of the Milli confederation. These tribes had progressively migrated in from the north during the 19th century, pushing back the Arab Tribes which had previously occupied the area. Local Kurds living in the plains to the east of the modern town reportedly provided lodgings at their encampment for a French-led archaeological team on its way to survey the nearby ancient Assyrian site of Arslan Tashî (Kurdish: Shêran‎) in the summer of 1883. As of 1892, there were three homesteads situated in the area. During the construction of the Baghdad Railway, Kurdish raiders from the Busrawi and Shahin Bey clans—rivals who lived south and east of today's Kobanî - reportedly harassed work crews attempting to mine basalt from the nearby hills, partially owing to the fact that the German companies responsible for its construction were lax in providing payment and compensation to local landowners. German engineers staying in the area from 1912 to 1913 described Arab Punar as a "small Kurdish village around 35 km (22 mi) east of the Euphrates" comprising a small cluster of square mud-brick huts, many with domed roofs; the local chief's hut was notable among these in its incorporation of European-style doors and windows and its concrete flooring. The area was apparently also known for its swarms of biting sand-flies. The newly-built town began to form south of a simple train station built in 1912 along the railway by workers from the nearby town of Suruç. The train station was part of the Baghdad Railway project launched by the Ottoman government to connect Baghdad with Berlin. Refugees fleeing the Armenian Genocide in the Ottoman Empire settled in the newly built town around 1915, and were soon joined by more Kurds from nearby areas. Many of the Kurds who settled in Kobanî were originally from Turkish Kurdistan. Some fled persecution following the Kurdish-led Sheikh Said rebellion in 1925. After the demarcation of the border with Turkey along the railway line in 1921, the northern part of Mürşitpinar was left on the other side of the border. This small settlement is incorporated in the Suruç district and still has a little railway station and a border crossing gate. By the middle of the 20th century, there were three Armenian churches and two schools in the town, but many Armenians emigrated to the Armenian Soviet Socialist Republic in the 1960s while others moved to bigger cities, including Aleppo and Beirut, as well as cities in the USA and other countries. The town was also home to a small Syriac Orthodox community, but their numbers dwindled and the town's only Syriac Orthodox church was demolished in the early 1960s. The city's infrastructural layout was largely planned and constructed by French authorities during the Mandatory period, and a number of French-built buildings were still standing and in use until recently. During this period, the city of Suruç served as the regional center of Kobanî. The area was marked by several border crossings with Turkey, unsanctioned by either the Turkish or French Mandatory governments. The crossings became a source of numerous Turkish complaints and led to the establishment of a French intelligence office in Kobanî to monitor border activity. Throughout the 20th century, the border remained officially closed even as the neighbouring towns of Tell Abyad and Jarablus—both of which had smaller Kurdish populations—were allowed to have commercial border crossings, a situation which economically marginalised Kobanî for many years. However, there was limited traffic at the Kobanî-Mürşitpinar gate and passengers from Kobanî often crossed through it to travel by train to Aleppo. By 2011, as a result of the Syrian Civil War, traffic through this gate increased. Wounded and sick people could cross to the Turkish side while trucks carrying goods crossed into Kobanî from Mürşitpınar. 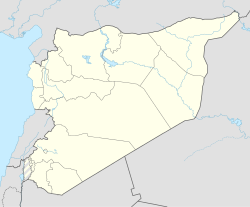 Prior to the Syrian Civil War, Kobanî was the administrative center of Nahiya Ayn al-Arab and Ayn al-Arab District. When Syria gained independence from France in 1946, the intelligence building[which?] served as the political office of the Kobanî area's highest-ranking local administrator. Kobanî started to develop as a city in the 1950s when it was further separated from Suruç as a result of the Turkish government mining of the border area. The People's Protection Units (YPG) took control of Kobanî on 19 July 2012. The Syrian authorities in Kobanî and other Kurdish towns evacuated the government offices and centers without any fighting taking place between the Syrian and Kurdish forces. Since July 2012, Kobanî has been under Kurdish control. The YPG and Kurdish politicians anticipated autonomy for the area, which they consider part of Rojava. After similar less intense events earlier in 2014, on 2 July the town and surrounding villages came under a massive attack from fighters of the Islamic State of Iraq and the Levant. On 16 September, ISIL resumed its siege of Kobanî with a full-scale assault from the west and the south of the city. Kobanî Canton had been under attack by ISIL militants for several months. In September 2014, militants occupied most of the Kobanî region, seizing more than 100 Kurdish villages. As a consequence of the ISIL occupation, up to 200,000 Kurdish refugees fled from Kobanî Canton to Turkey. Turkish authorities did not allow the refugees to enter with any vehicles or livestock that they had. In captured villages, militants committed massacres and kidnapped women. IS militants, however, were not able to occupy all of Kobanî itself, as the YPG and YPJ forces managed to defend a part of Kobanî and later several nearby settlements. After weeks of isolation, which resulted from Turkey's preventing arms and fighters from entering the town (which in turn was due to the general hostility of the Turkish establishment towards Kurds with any links to the PKK), the US-led coalition began to target ISIL with a larger number of airstrikes. From September 2014 through January 2015, hundreds of airstrikes struck ISIL fighters and leveled most of the administrative buildings and houses in the city center, helping to stop the ISIL advance. On 20 October there were reports that Turkey, under significant US pressure, would allow Kurdish fighters from Iraqi Kurdistan to cross into Kobanî. About 150 Kurdish troops were admitted on 29 October, which then began to turn the tide of the siege in favor of the Kurds. The YPG forced ISIL to retreat from Kobanî on 26 January 2015, thus lifting the siege. The city is currently under YPG control. In October 2014, Dr. Widad Akrawi, President of Defend International, dedicated her 2014 International Pfeffer Peace Award to, among others, all residents of Kobane because, she said, facts on the ground demonstrate that these peaceful people are not safe in their enclaves, partly because of their ethnic origin and/or religion, and they are therefore in urgent need for immediate attention from the global community. She asked the international community to make sure that the victims are not forgotten; they should be rescued, protected, fully assisted and compensated fairly. On 4 November 2014, Dr. Akrawi, said that "a massacre can be avoided, if there is a well-organized and well-defined plan on how to deal with IS – a plan that sets out the strategic and tactical activities to be undertaken at the international, regional and local levels," adding that journalists, humanitarian- and human rights organizations are not allowed to pass through Turkish checkpoints near the border. On 25 June 2015, fighters from the Islamic State of Iraq and the Levant detonated three car bombs in Kobanî, close to the Turkish border crossing and launched a surprise assault on the town. At least 220 Kurdish civilians were massacred in mass killings by ISIL fighters or were killed by the group's rockets. Many more were wounded by the attack, making it one of the worst massacres carried out by ISIL in Syria. In another report Syrian Observatory for Human Rights and spokesman for the Kurdish People's Protection Units said that more than 200 Kurdish civilians were massacred. Women and children were among the bodies found inside houses and on the streets of Kobanî and its surrounding villages. The Syrian Observatory for Human Rights said that ISIL fired at anything that moved. Islamic State also committed a massacre in the village of Barkh Butan, about 20 kilometers south of Kobanî, executing at least 23 Syrian Kurds, among them women and children. Kurdish forces and the Syrian government claimed the vehicles had entered the city from across the border, an action denied by Turkey. After the ISIL siege was broken in early 2015, the Kobane Reconstruction Board asked for international assistance. According to a spokesman for the Syrian Kurds who control the town, Kobanî had been 70% destroyed. There have been several attempts to support Kobanî, especially from the Kurdish communities in Turkey and Iraq. Assistance was also offered by several European organizations. As of May 2015, Turkey has kept the border closed but allowed some materials to reach the city. The international community, including the USA, has not shown interest in rebuilding the town, nor have they pressured Turkey on the matter. By May 2015 more than 50,000 people had returned to the destroyed town. In May the Kobanî authorities, with the help of the municipality of Diyarbakır, managed to restore the water pump and supply for the urban area after 8 months without running water, repairing the pipelines and cleaning the main water tank. By May 2016, despite the challenges of the blockade by Turkey, reconstruction and return of inhabitants was well on the way. In an October 2016 report from the city of Kobanî, U.S. academic Si Sheppard observed: "Since the siege of Kobanî ended, reconstruction has barely begun to compensate for the havoc wrought on the city by both ISIS artillery and coalition airstrikes (...). Herculean efforts have cleared the streets, but water and power have yet to be restored. Although commerce is trickling back to life (...), more than half of the residential structures still standing are little more than blown out concrete shells. Yet the spirit of the people endures: Some now use defused ISIS rounds as ashtrays and flower pots." The documentary "Radio Kobani" won the Award for Best Documentary at the International Documentary Festival – Amsterdam (IDFA) in November 2016. Naples – In June 2015, the municipality of Naples, in Italy, recognised the municipality of Kobanî as a sister city. Ancona – In June 2015, the municipality of Ancona, Italy, recognised the municipality of Kobanî as a sister city. ^ a b "General Census of Population and Housing 2004: Ain al-Arab nahiyah" (in Arabic). Syrian Central Bureau of Statistics. Retrieved 15 October 2015. Also available in English: "Syria: 2004 census data". UN OCHA. Retrieved 15 October 2015. ^ "40 thousand have returned to Kobanê so far". BestaNûçe. 17 March 2015. Retrieved 12 October 2015. ^ a b "Syrian Kurds 'drive Islamic State out of Kobane'". BBC News. 26 January 2015. Retrieved 26 January 2015. ^ a b according to a 2013 estimate, about 90% Kurds, close to 5% Arab and Turkmen, and 1% Armenians. "The Second Report: Ayn al-Arab/Kobani, Etana Billetin-First issue". Etana Files. 1 December 2013. Retrieved 28 April 2014. ^ Sociéte Impériale du Chemin de fer de Bagdad, founded on 13 April 1903 with 40% ownership of Deutsche Bank, 30% Banque Impériale Ottomane, 10% Anatolische Eisenbahn-Gesellschaft, 7.5% Wiener Bankverein, 7.5% Schweizerische Kreditanstalt, 5% Banca Commerciale Italiana. ^ "Explained: Kobane or Ayn al-Arab?". Daily News. 28 August 2014. Retrieved 21 June 2015. ^ a b Other sources that refer to this subject include Nedal Yousef, 'Interview with Hussein Amin Hussein about [his book] 'Ayn al-Arab – One Hundred Years "حسين أمين حسين"...يتحدث عن مدينة "عين العرب" في مئة عام.. (esyria.sy) 9 April 2009. Hussein Ali Hussein, "Ayn Al-Arab over a century" (عين العرب في مئة عام), Dar Al-Aqsa, Damascus (2007); the book is a history of the town compiled for its centennial from accounts in living memory (notably from one Mohamed Abdi, who according to Hussein died in 1998 aged 118, as well as "other centenarians from the region"). ^ a b Patrick Cockburn, Isis in Kobani: Turkey's act of abandonment may mark an 'irrevocable breach' with Kurds across the region Independent 7 October 2014. ^ a b c d e Tastekin, Fehim (28 October 2014). "Erdogan plays 'Arab card' in Kobani". Al-Monitor. ^ a b c Movsesian, Mark (27 October 2014). "Kobani, Then and Now". First Things. ^ The district of Kobanî comprises about 170 villages: Gérard Chaliand, A People Without a Country: The Kurds and Kurdistan, 1993, p. 195. name of the station: Office International de Renseignements sur les Sauterelles de Damas, 1930, p. 43. ^ Kheder Khaddour, Kevin Mazur, The Struggle for Syria's Regions (MER269) "State policy Arabized this town's name in the 1980s to ‘Ayn al-‘Arab, meaning the "spring of the Arabs." The running joke among residents is that the town has neither Arabs nor a spring." ^ a b Woolley, Sir Leonard (1920). Dead towns and living men: Being pages from an antiquary's notebook. Oxford University Press. pp. 178–221. ^ Heuzey, Léon; Hamdy-Bey (1899). "Les ruines de Arslan-Tash". Comptes rendus des séances de l'Académie des Inscriptions et Belles-Lettres (in French). 43 (5): 617. ^ Nedal Yousef, 'Interview with Hussein Amin Hussein about [his book] 'Ayn al-Arab – One Hundred Years "حسين أمين حسين"...يتحدث عن مدينة "عين العرب" في مئة عام.. (esyria.sy) 9 April 2009. Hussein Ali Hussein, "Ayn Al-Arab over a century" (عين العرب في مئة عام), Dar Al-Aqsa, Damascus (2007); the book is a history of the town compiled for its centennial from accounts in living memory (notably from one Mohamed Abdi, who according to Hussein died in 1998 aged 118, as well as "other centenarians from the region"). ^ Boyes, William (March 1916). "Persönliche Erinnerungen vom Bau der Bagdadbahn". The Technologist: Mitteilungen des deutsch-amerikanischen Techniker-Verbandes (in German). 21 (3): 80–86. ^ Cheterian, Vikin (2 October 2013). "Kurdish Leader Denies Syrian Kurds Seek Secession". Translated by Sami-Joe Abboud. Al Monitor. Retrieved 28 April 2014. Originally published in Arabic by Al-Hayat as أكراد سورية لا يريدون الانفصال نحارب النظام و"النصرة" ونخشى مجازر on 28 September 2013. ^ Korucu, Serdar (24 October 2014). "Bir Ermeni çocuğun Kobani hatıraları..." (in Turkish). Radikal. ^ السريان ..... عين العرب وتل أبيض (in Arabic). qenshrin.com. 18 October 2005. Retrieved 11 December 2014. ^ Yildiz, Kerim (2005). The Kurds in Syria: The Forgotten People. London: Pluto Press. p. 25. ISBN 0745324991. ^ "Sınır Kapıları Listesi HUDUT KAPILARI NEVİLERİN GÖRE-AÇIKLAMALI SINIR ÜLKELERİ" (PDF) (in Turkish). Turkish Interior Ministry. 26 March 2013. p. 3. Archived from the original (PDF) on 20 September 2013. Retrieved 3 November 2014. ^ "More Kurdish Cities Liberated As Syrian Army Withdraws from Area". Rudaw. 20 July 2012. ^ "NATO's Secret Kurdish War: Turkey Prepares Iraq-Style Attacks Inside Syria – OpEd – Eurasia Review". Retrieved 29 October 2014. ^ "What's happening in Kobane?". Kurdish Question. 6 July 2014. Archived from the original on 7 January 2015. ^ a b "Isis onslaught against Kurds in Syria brings 'man-made disaster' into Turkey". The Guardian. Retrieved 29 October 2014. ^ a b IPD Group. "ISIL seizes 21 Kurdish villages in northern Syria, close in on Kobanî – World News Report". Retrieved 29 October 2014. ^ Ayla Albayrak. "Hundreds Wait for Kobani Fighting to End, Risking Lives at Border". The Wall Street Journal. Retrieved 29 October 2014. ^ "Turkey to Allow Reinforcements". The Independent. Retrieved 29 October 2014. ^ "Mapping action and identity in the Kobani crisis response, Thomas McGee, Kurdish Studies Journal, 2016". Retrieved 2016-11-11. ^ "Save The Yazidis: The World Has To Act Now". Retrieved 2014-09-12. ^ "Artist Jane Adams invited to join DI campaign". Retrieved 2015-09-29. ^ "Save The Yazidis: The World Has To Act Now". Retrieved 2015-09-29. ^ "Dr Widad Akrawi Interviewed at RojNews: Do you see a new Kurdish massacre looming in Kobane?". Retrieved 2015-10-09. ^ "Syrian Kurds say thwart big Islamic State attack on border town". Reuters, Yahoo News. ^ "HRW: ISIS murdered 233 civilians in Kobanê since June". Dicle News Agency. ^ "Syria crisis: Islamic State 'kills 120 civilians' in Kobane". BBC News. ^ "Islamic State kills at least 145 civilians in Syria's Kobani". Reuters. ^ "ISIS 'kills at least 146 civilians' in Kobane, activists say". Yahoo News. ^ "Mass Killings by ISIL Fighters in Syrian Kurdish Town". The New York Times. ^ "Isis in Kobani: Why we ignore the worst of the massacres". The Independent. ^ "Syria Islamic State: Kurds 'claim control over Kobane'". BBC News. ^ "Kurdish fighters retake Syria's Kobani". The Daily Mail. ^ "Syria crisis: IS re-enters Kurdish-held city of Kobane". 25 June 2015. Retrieved 25 June 2015. ^ Paton Walsh, Nick (5 May 2015). "Syrian town tries to rise from ashes after ISIS defeat". CNN. ^ Geerdink, Fréderike (9 May 2015). "Closed Turkish border endangers present and future of Kobani". Beacon. Retrieved 12 May 2015. ^ Clifford, Peter (15 May 2015). "Kobane / Cizire Update 90: Kurdish Advance in Cizire Continues Taking 20+ Villages from Islamic State in 48 Hours". Retrieved 12 May 2015. ^ "Syria civil war: New beginnings in Kobane". Al Jazeera. 2016-05-13. Retrieved 2016-05-13. ^ "KRC opens the first hospital in Kobani". Hawar News Agency. 2016-09-24. Retrieved 2016-09-24. ^ Afandi, Ezzat. ""Nexweşxaneya Viyene Niştergeriyî"". www.facebook.com (in Kurdish). ^ Afandi, Ezzat. "official letter". www.facebook.com. ^ "Das "Wiener Spital" in Kobane". Kurier. 2014-12-31. Retrieved 2014-12-31. ^ Si Sheppard (25 October 2016). "What the Syrian Kurds Have Wrought. The radical, unlikely, democratic experiment in northern Syria". The Atlantic. Retrieved 2016-10-25. ^ "Kobani film wins best Dutch documentary award". ARA News. 25 November 2016. ^ "Rome Declares Kobane 'Sister City'". Kurdishquestion. 5 April 2015. Retrieved 2016-08-19. ^ QuotidianoNet (2015-04-23). "Roma si gemella con Kobane: "Simbolo di resistenza" - QuotidianoNet". QuotidianoNet (in Italian). Retrieved 2017-02-15. ^ "Roma abbraccia Kobane - Core". Core (in Italian). 2015-04-24. Retrieved 2017-02-15. ^ "Napoli in gemellaggio con Kobane: "Vicini a chi lotta per la pace e la libertà"". NapoliToday (in Italian). Retrieved 2017-02-15. ^ "Gemellaggio con Kobane, città simbolo della resistenza contro l'Isis: Sel deposita mozione". AnconaToday (in Italian). Retrieved 2017-02-15. This page is based on the Wikipedia article Kobanî; it is used under the Creative Commons Attribution-ShareAlike 3.0 Unported License (CC-BY-SA). You may redistribute it, verbatim or modified, providing that you comply with the terms of the CC-BY-SA.